I suggest buying some pre-made balls to get started. They cost a few dollars each and it's a quick way to get going. The pre-made balls are generally birch and somewhat round. Don't get too frustraited with them though. Birch isn't the best wood for these balls, and they're likely to wobble in your chuck. I strongly recommend NOT using them as a reference template for your chuck or anything else for that matter. Note: the pre-made balls are probably round when they leave the factory in China where they're made. 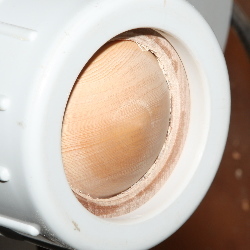 But wood moves as its moisture content changes and that's very likely the reason they're not round at your shop. Congratulations if the balls you buy are round (keep your fingers crossed that they stay that way). The notable takaway is that no jig is capable of doing the entire job by itself. You're going to have to do at least some final clean-up by hand if nothing else. I use a combination of methods 1 & 2. I rough turn balls to about 2-3/4" before I take them to size on my shop made sphere jig and then finish them up by hand. Look here for more information on sphere jigs. Wood contains water. Pretty much all wood does. And if you dry it out completely, it will just absorb water back from the environment. Further, as the abient moisture changes day to day or season to season, the moisture content of the wood changes along with it. As the moisture content of wood changes, it's shape usually changes as well. The wood is perfectly happy with this fact, we are often not (I recommend Bruce Hoadley's 'Understanding Wood' for a great technical explanation of all this). When it comes to wooden balls, moisture changes quickly change a round ball into a not-so-round ball. Which makes it hard to turn well. You may want to consider a wood stabilizing product. Mineral oil is a substance that can replace much of the water in wood and reduce its shape changing due to ambient moisture changes. Before you dip your balls into some baby oil, consider a product such as Turner's Choice which includes driers and can make the whole process a lot more successful. I soak my rough turned balls in Turner's Choice for a couple of hours or overnight (or until they stop excreting water, fizing actually) and then dry them for a week or 2 before working them. 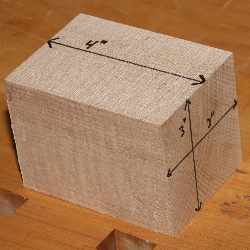 1 I start with a block of wood about 3" x 3" square and about 4" long. These aren't always easy to find though. 2 Mark the centers of the piece on the ends and draw a circle to the edges. Then I relieve the edges at 45' on the bandsaw. This makes it faster to turn to a cylinder on the lathe. 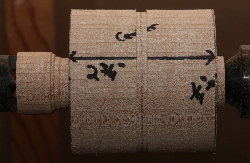 3 Mount between centers on the lathe and turn to a cylinder. 4 Mark a line 1/4" from the right end of the stock and another about 1" from the left end of the stock. 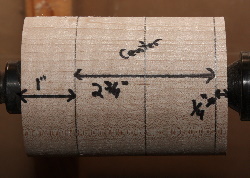 This leaves the 2-3/4" rough sphere in between those lines. Mark the center of the rough sphere. 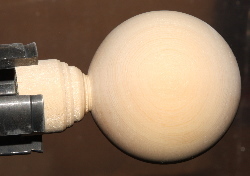 5 Wast the wood on both ends leaving a 1" round spigot on the left and just enough to hold the ball-to-be on the right. 6 Use a parting tool to take the center of the ball to exactly 2-3/4" diameter. 7 Mark the center of the rough sphere with a pencil line. 8 Rough shape the rest of the ball for a 2-3/4" sphere. I rough shape my spheres and let them settle for a bit. If the wood is going to move, I'd rather it happen now, before I take the ball to the final dimension. 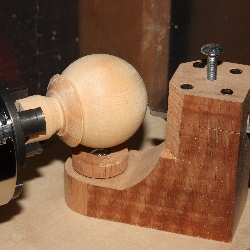 9 Part off right side to drop the rough ball off the lathe. 10 Optional: Remove from lathe and soak in Turner's Choice for 4+ hours (or overnight). This will help stabilize the wood movement and usually makes the wood a bit easier to cut. 11 Allow to air dry for 1-2 weeks if soaked in Turner's Choice. 12 Mount spigot in pin jaws of chuck on the lathe. 13 Use shop-made ball jig to shape to just 1/32" over 2-1/2". 14 Sand lightly and very carefully to not take out of round (end grain will sand differently than face grain). 15 Use a spindle gouge to shape as much of the spigot as possible - usually only about 1/2" or less remains. 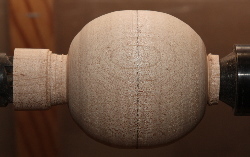 17 Mount ball in the hemispherical chuck with spigot remains facing out. 18 Turn off remainder of spigot with the spindle gouge.